Background: Mastography is a strong screening and diagnostic tool for the primitive detection of cancer in the breasts. The acquired mammogram images or stored mammogram images are often corrupted by the outliers. These outliers must be eliminated before microcalcification. Method: In the proposed scenario, an adaptive filter that uses median of minimum distance from its neighbourhood is used to eliminate the salt and pepper noise. The minimum Euclidean distance between each of the non noisy pixels allows the algorithm to choose a better value to replace the corrupted pixels. The algorithm terms the pixel to be corrupted if it holds 0 or 255; otherwise, the pixel is termed uncorrupted. The algorithm uses 3x3 window initially and increases the window size, if the entire window consists of outliers. If the uncorrupted number of pixels inside the processing window is at least 2, then the corrupted pixel is replaced by the median of minimum Euclidean distance between each non noisy pixel and the corrupted pixel. If the number of non noisy pixels inside the current processing window is 1, then the corrupted pixel is replaced by it. Results: The Mini Mias database is used to assess the performance of the (ADBMEDUTMF) Adaptive Decision based minimum Euclidean distance unsymmetrical Trimmed median filter with the other standard and recently proposed algorithms. The ADBMEDUTMF proved efficient in removing the corrupted pixels and found to operate well even at noise densities as high as 90% without inducing any artifacts. 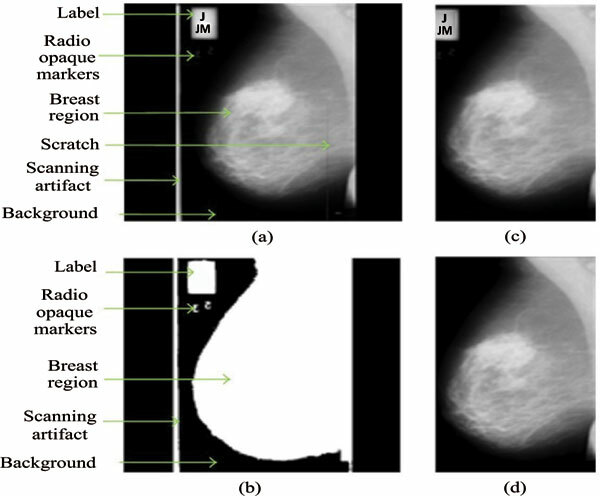 Conclusion: Exhaustive test results suggest that the ADBMEDUTMF algorithm exhibits very good noise suppression characteristics with minimum error and higher information preservation capability even at very high noise densities in different mammogram images. This makes the algorithm suitable for low level processing. Salt and pepper noise, euclidean distance, median of minimum distance filter, minimum error, pixel.